A close reading of this passage reveals a significant nuance. Just as the unconscious knowledge of the scholar is described as a more transcendent, ideal form of intellect, “intellect as it is in-itself,” so the covert presence of divine infinitude within creation is “encompassed within its source,” i.e. within the transcendent essence of G‑d. On the other hand, it is emphasized that the infinite assertion of divine presence “remains as it was,” immanently invested throughout the concealing contours of the created realm. 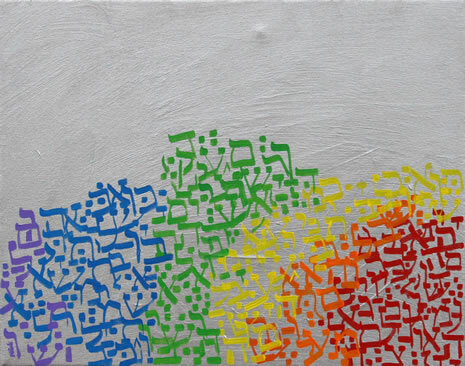 Alyse Radenovic, "Genesis 2:1-3 Silver & Rainbow"
In its traditional understanding, tzimtzum is a way of moving beyond G‑d’s essential self into the realm of creation, where finite forms emerge, and with them the illusion of autonomy. But on R. Schneur Zalman’s reading this externalizing move towards otherness is itself an internalizing move into the essential intimacy of divine selfhood. It is from the transcendent core of divine being, which is neither enhanced by revelation nor inhibited by concealment, that the possibility of otherness emerges. R. Menachem Mendel’s intention here is not simply to amplify a point that might otherwise have been missed. The intention is rather to exploit the interface of these two texts in order to illuminate a third. The next step in this process is to show that Patach Eliyahu’s internalizing conception of tzimtzum is also reflected in Lehavin Mah Shekatuv Be’otzrot Chaim’s analogy of the scholar’s concealed knowledge of a text. Based on this insight we can then reread the Tanya’s application of a similar analogy through a conceptual lens that is at once sharper and more complex. “From this,” R. Menachem Mendel continues, “we can understand the significant depth of the analogy mentioned in Sefer Shel Beinonim (Tanya), chapter 33, to illustrate the unity of G‑d: ‘like the effacement of letters of speech and thought in their source and root, the being and essence of the soul’ …and it is explained there in chapters 20 and 21.” He leaves it for us to unpack the significance of his insight. The success of this contemplative practice depends on a clear understanding of the utter singularity of divine being. But our experience of the physical realm as something other than G‑d, as something that G‑d created, stands as a compelling obstacle to the achievement of such clarity. The purpose of this comparison is firstly to demonstrate the insignificance of creation relative to the all-encompassing transcendence of G‑d, and secondly to illustrate how creation is utterly effaced within the all-encompassing singularity of divine being. Human speech is a real process of externalization, but the divine process of creation only simulates externalization, because ultimately there can be nothing external to G‑d. Accordingly, we need to conceive of the creative word of G‑d as being more analogous to human thought, which is contained within the self, than to human speech, which is externalized and extended into the realm of otherness. As we have already noted, the purpose of this discussion is to provide the Tanya’s readership with a contemplative strategy to invoke an awareness of the exclusive singularity of divine existence, which will in turn inspire a personal commitment to preserve the integrity of divine unity through Torah study and mitzvah observance. The focus here, in other words, is more practical than theoretical. One might be forgiven, therefore, for seeing R. Schneur Zalman’s analogy of “letters” as nothing more than an illustrative device. But in contextualizing the discussion in the Tanya with the texts in Likutei Torah and Torah Or described above, R. Menachem Mendel exposes the conceptual depth veiled within this analogy. Taken on its own terms, R. Schneur Zalman’s conclusion in Tanya does not seem to displace the central conception of tzimtzum as a process of externalization, as described above. It merely reframes this externalizing process as a simulation that does not actually place any distance between G‑d and creation. At the end of chapter 21 he explicitly emphasizes that we are not speaking here of the removal of divine presence, but of its concealment: “All occurrences of tzimtzum are in the aspect of concealed countenance, to veil the revelation and vitality drawn from the word of G‑d.”34 Yet, even in this passage, the externalizing symbol of verbal expression is preserved intact, though it has already been tempered by the more internal analogy of thought. Tzimtzum is still understood to place a gap between transcendent divinity and the creative process, albeit an epistemological gap rather than an ontological one. When its implications are fully unpacked, R. Menachem Mendel’s gloss in Lehavin Mah Shekatuv Be’otzrot Chaim provides an innovative reading of the created cosmos as the self-referential textualization of divinity. But this analysis also provides a more general example of the intertextual method with which he engaged his grandfather’s teachings—especially in his role as editor and commentator in Likutei Torah—and of the interpretive boldness with which he further developed Chabad’s mystical thought. In placing different texts in correspondence to one another, he yet preserves their autonomous integrity. It is in highlighting the ways in which they overlap and are mutually illuminated that he uncovers paradoxical depths that previously went unarticulated.39 Here, the interplay of different ways in which the analogy of letters is deployed—whether as text, as thought, or as speech—uncovers a textual theory of the interrelationship of G‑d with the created cosmos. In the following section we will explore a sociological theory of similarly cosmic proportion, as described elsewhere in R. Menachem Mendel’s writings. 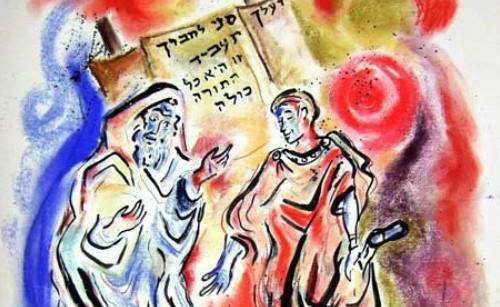 In his classical commentary to the Talmud, Rashi offers two possible interpretations of Hillel’s statement. The first renders it an allegorical reference to the obligation to fulfill G‑d’s will: “Your friend… this refers to the Holy One, blessed be He. Do not transgress His word, for it is hateful to you when your friend transgresses your will.” Rather than the interpersonal contract that the literal reading highlights, this allegorical explanation places G‑d at the center of ethical and religious life. This provides an adequate explanation of how Hillel’s teaching comprises “the entirety of the Torah,” but only by circumventing the social component suggested by a literal reading. The central tension between the utter singularity of G‑d and our direct experience of the fractured multiplicity of the created realm, has already been noted above. In the present discourse, the concern to overcome this tension is expanded beyond the private realm of personal dedication to G‑d, and enshrined as the ultimate purpose of the cosmos as a whole. While the previous discussion focused on the kabbalistic motifs of tzimtzum and reshimu, the present one focuses on the motifs of tohu and tikun, which respectively embody chaotic multiplicity and unified harmony. It is the latter that constitutes the ultimate telos of the cosmos, and which must first be realized in human society. The ideal state of unified harmony is not merely something that we must seek to realize, but even now is the subliminal foundation upon which all the diversities of reality stand. This is illustrated by the analogy of the human body, whose apparently distinct limbs and organs actually function in harmony, as unified parts of a single person. The body is not simply a collection of parts, but an integral system in which each element is rendered complete only as a component of the greater whole. This model is applied first to the Jewish nation, and then to the entire cosmos. The above discussion presents us with an innovative reconceptualization of the degree to which the social and the spiritual, the public and the private, are intertwined. It is the overt revelation of all-encompassing divinity that provides the fundamental basis of social integrity. It is social integrity that provides the fundamental basis for us to ascend as individuals before G‑d, wherein all souls are encompassed as one. Yet, the second half of this discourse, as it is presented in Derech Mitzvotechah, takes all this one step further. We now move from a model of spiritual and social interdependence to a model of socially dynamic spirituality. Here R. Menachem Mendel does not only describe G‑d as the basis for interpersonal and cosmic harmony, but as an active participant in cosmic society. Similarly, interpersonal harmony is not merely the basis for spiritual and religious activity, but is itself the most effective vehicle to the sacred telos of all existence. As in the earlier part of the discourse, this additional teaching is presented by R. Menachem Mendel as a further analysis of Hillel’s statement, “That which is hateful to you, do not do to your friend. This is the entirety of the Torah.” Notably, Hillel reformulated the positive commandment “to love your fellow as yourself” in distinctly negative terms. This led some commentators to conclude that he was indeed interpreting the biblical formulation to refer only to negative commandments, such as “do not murder” and “do not steal,” rather than as a positive injunction to do good to one’s fellow.58 In the present discourse, however, the distinctly negative formulation is not interpreted as a limitation on the scope of Hillel’s teaching, but rather as an incisive indication of what it really means to love another individual. You do not see your own faults because they are submerged and effaced in overwhelming love… But when another points out your fault and comprehends it, you becomes greatly angered, though you know yourself that it is true. This is because your anger is not due to the essential depravity that is falsely imagined by your friend, for you know that it is true, but rather [you are angered] due to your friend’s knowledge… being intrusive and disturbing… You are angry at your friend for the exposure, that he exposed your fault from the concealing veil of love. The undoing of this bifurcation is the foundation and telos of all the commandments of the Torah. But this is achieved most saliently through the loving unification of all the souls of Israel, since they most directly embody the indwelling of G‑d within the multiplicity of creation. It is in overcoming that multiplicity with mutual love, seeing themselves as a single whole, that the indwelling of G‑d is itself repaired and reunified. To the degree that Israel is harmoniously transparent to the utter singularity of G‑d, so divine transcendence is openly unified with its indwelling in creation. The discussion in Derech Mitzvotechah places specific emphasis on the souls of Israel. But the fact that their collective interinclusion is primarily identified with the soul of Adam, the father of all humanity, implies that intersocial harmony must ultimately extend to all of mankind. Moreover, while the souls of Israel are upheld as the most salient expressions of divinity within the world, their mission is undeniably universal—to reveal G‑d’s presence throughout all of creation, and to encompass the entire cosmos in harmonious unity. As documented in a recent study by Shaul Magid, what remains implicit in the present text is explicated in an earlier iteration of this teaching found in Kedushat Levi, by Rabbi Levi Yitzchak of Berditchev, a contemporary and colleague of R. Schneur Zalman. While less developed in terms of its psychological, sociological, and cosmological theorization of what it means to love the other, this earlier iteration is notable for its emphasis that Hillel’s statement was made in reply to a convert; a non Jew who sought to understand the covenantal Torah and thereby enter the Jewish fold. In our earlier discussion of Likutei Torah, an intertextual model of the cosmos emerged. In the present discussion of Derech Mitzvotechah, a corresponding intersocial model unfolds. Just as the creative process can be read as the self-referential textualization of divinity, so can it be read as the socialization of divinity; a process by which G‑d builds a facade of multiplicity and otherness, precisely in order that it should be overcome. The macrocosmic schism between divine transcendence and its indwelling in creation is embodied in our microcosmic experience as individuated selves. And to repair the schisms of society is to achieve the ultimate telos of all reality. G‑d is affirmed in society to the degree that society is transparent to, and thus effaced within, the divine source of social integrity. Equally important is the point made earlier, that if spiritual practices and experiences do not stand on an interpersonal foundation then they are not sacred either. The sacredness of personal spirituality is only affirmed to the degree that it effaces the cosmic boundary that separates the other from the experience of the individual. As individuated selves we are incomplete and disempowered, reflecting the self-destructive anarchy of tohu rather than the sacred unity of tikun. To overcome individuation is not to be diminished but to be enlarged, expanding our sense of self beyond physical constriction and corporeal intuition. The empathetic overcoming of otherness brings all individuals to their ultimate completion in the composite singularity of the divine self, which itself constitutes the cosmic society. See R. DovBer Levine, Exhibition of the Tzemach Tzedek, the Third Chabad Rebbe, at the Chabad-Lubavitch Library (New York, 2015), viewable in English here, and in Hebrew here. For biographical details see R. Chaim Meir Hillman, Beit Rebbi (Berditchev, 1902), Section 3; Tzvi M. Rabinowicz ed., The Encyclopedia of Hasidism (Jason Aronson Inc., 1996), 429. See also Ilia Lurie, The Habbad Movement in Czarist Russia 1828-1882 (Magnes Press, Jerusalem, 2006). The original dictum appears in Pirkei Avot (1:6). This anecdote was transmitted by Rabbi Yosef Yitzchak Schneersohn in the name of his father, Rabbi Shalom DovBer Schneersohn, and published in Rabbi Menachem Mendel Schneerson, Hayom Yom (Kehot Publication Society, 1943), entry for the 14th of Menachem Av, which is viewable here. See also Rabbi Menachem Mendel Schneerson, Torat Menachem - Reshimot Ha-yoman (Kehot Publication Society 2009), 460, for a pre-chassidic analogue. R. DovBer Levine, Ibid., 4. On the manuscripts and their publication see Idem., Toldot Habad Be-russia Ha-tzaris (Kehot Publication Society, 2010), 110-136; R. Zushe Wolf, Hotza’at Seforim Kehot: Toldot Hotza’at Ha-sefarim Ha-chabadit (Kehot Publication Society, 2013), 227-229. Beit Rebbi, Section 3, Chapter 5. “When revealing an intellectual matter or deep wisdom in writing, the hand writes what rises in the depth of one’s intellect with all the logical details of that intellectual idea. At that moment one has great pleasure from one’s grasp of that intellectual concept, and a great desire to explain it in in clearly written prose; each matter in its place, in systematic order. This is achieved specifically through one’s analysis and introspective contemplation while writing, attempting to find the phraseology and the precise language [literally, “the letters”] through which the deep concept will be revealed with clarity, and without any mistake falling into any one of the logical elements. Through the power of one’s thoughts and one’s contemplation one finds such words [“letters”] that fit the deep concept at hand, encompassing all the details of one’s logical idea in all their sharpness and precision. Given the discussion of “letters” later in the present article, the use of this term in this passage is noteworthy. It is also noteworthy that it was R. Yosef Yitzchak who transmitted the tradition from whence the present article derives its title, as cited above, note 2. For a related teaching on the act of writing, see below, n. 31. R. Chaim Meir Hillman, Beit Rebbi, Section 3, Chapter 2, Note 3. On the transcripts of Rabbi Schneur Zalman’s oral discourses and their scribes see R. Yosef Yitzchak Keller, Reshimat Maamarei Admur Ha-zaken, in R. Yehushua Mondshine ed., Kerem Chabad, Issue 4, Vol. 2 (Kfar Chabad, 1992), 349-353; Eli Rubin, Living with the Times: Rabbi Schneur Zalman of Liadi’s Oral Teachings. On the title page of both of these volumes R. Menachem Mendel credits R. Yehuda Leib with transcribing “most of the discourses…” and doing so “with an full and beautiful script” (ketivah tamah u’me’usharah). See the relevant discussion and citations in Naftali Loewenthal, Communicating the Infinite: The Emergence of the Habad School (University of Chicago Press, 1990), 67; R. DovBer Levine, Sekirah Klallit Al Derech Ha-maamarim Ha-ketzarim, in Sefer Maamarei Admur Ha-zaken Ha-ketzarim (Kehot Publication Society, 1981), 608. On R. DovBer’s way in the development of Chabad thought, his “communicative ethos” and “rationalism,” see Naftali Loewenthal, Communicating the Infinite, 105-107, 140, 168 and 287 n. 180. Aside from the philological record, numerous traditions testify to R. DovBer’s inspired, deeply personal, penetrating and innovative development of his father’s teachings. In the words of R. Chaim Meir Hillman, Beit Rebbi, Section 2, Chapter 1: “Chassidic teachings were essential life to him, literally.” On one occasion R. DovBer described the delivery and reception of a new discourse as “the revelation of the root of the soul in the body,” citing the writings of R. Chaim Vital to the effect that such an experience is greater than a mystic encounter with Elijah the Prophet (gilui eliyahu), and greater than reception of the Holy Spirit (ruach ha-kodesh). (Ibid., Section 3, Chapter 1, Note 7.) On R. Menachem Mendel's relationship with R. DovBer see below, note 10. R. Menachem Mendel had immense respect for R. DovBer, who was both his uncle and his father-in-law, and commented that if the latter’s finger were to be cut Chassidic teachings would flow rather than blood (R. Chaim Meir Hillman, Beit Rebbi, Section 2, Chapter 1, Note 5). Nevertheless, he took issue with R. DovBer’s approach to the communication of R. Schneur Zalman’s teachings. Elsewhere R. Hillman writes that on one occasion R. DovBer faced trumped up charges and asked his son-in-law why it befell him to be accused. “In my opinion,” came the response, “this is because the words of our great teacher have been forgotten.” R. Hillman explains that R. DovBer “articulated Chassidic teachings at very great length, such that the listeners were unable to discern which were the words of our great teacher [R. Schneur Zalman] upon which the teaching [of R. DovBer] was based. His son-in-law [R. Menachem Mendel]… had a different way, to preserve the words of our great teacher [R. Schneur Zalman] as they are, and afterwards to add explanation.” (Beit Rebbi, Section 2, Chapter 6, Note 1. See also Ibid., Section 3, Chapter 2, Note 5.) On R. DovBer and R. Menachem Mendel as having a respectively more oral and more textual focus, see below, note 13. See R. DovBer Levine, Sekirah Klallit Al Derech Ha-maamarim Ha-ketzarim, in Sefer Maamarei Admur Ha-zaken Ha-ketzarim (Kehot Publication Society, 1981), 604. See the relevant remarks by R. Yehoshua Mondshine, Parshat Hadfasat Ha-likutei Torah Le-sefer Bereishit in Kfar Chabad Magazine, # 931, viewable here; R. Yosef Yitzchak Keller, Ha-chibur Ve-ha-arichah Shel Likutei Torah Le-gimul Parshiyot in Heichal Habesht, Issue 6 (Heichal Menacham, New York, 2004), 157-158. See also the letter by Rabbi Yosef Yitzchak Schneersohn, printed in Mafteichot Ve-he’orot Le-sefer Likutei Torah, at the back of the standard edition of Likutei Torah from 1949 and on, and Beit Rebbi, Section 3, Chapter 5, Note 2. Of course, both made transcriptions of R. Schneur Zalman’s discourses, and were involved in editing them for publication, and both delivered oral discourses themselves. The distinction made here applies to their chief focus, and their primary mode of thinking through and developing ideas. This philological observation is supported by anecdotal testimony that after delivering oral discourses in R. Menachem Mendel’s presence R. DovBer would often encourage him to transcribe them, indicating that the latter appreciated the former’s affinity for the written word, see Ibid., Section 3, Chapter 1, Note 8. It is also said that in his later years R. Menachem Mendel would read his oral presentations of Chassidic teachings from a written text, see R. Schneur Zalman Duchman, Le-sheima Ozen (Brooklyn, 1963), 59 (#25). On the intertextuality of kabbalistic literature, see Daniel Abrams, Kabbalistic Manuscripts and Textual Theory: Methodologies of Textual Scholarship and Editorial Practice in the Study of Jewish Mysticism (Magnes Press / Cherub Press, Jerusalem, 2nd edition 2013). The following passage, from the introduction, is particularly noteworthy, capturing a sense of the nexus of singularity and fragmentation that aptly resonates in the present context: “Kabbalistic literature may indeed be an intertextual matrix of linguistic codes, a transdiscursive rabbinic discourse that records the interpretive life of the kabbalists as experiential interpreters of the divine, reflected in the written word. But each text, nevertheless, is part of an ongoing chain of writing that draws the reader, commentator and also ostensibly the next kabbalistic writer into this very same textual world.” (Page 13.) In one sense, the present study represents an application of Abrams’ general call to pay closer attention to the fragmentary and intertextual layers of texts that are otherwise presented—to greater or lesser degrees—as singular, closed, and complete. It is in peeling apart different textual iterations, in assessing the ways that these iterations are in dialogue with one another, and with other related texts, that the full richness of these literary traditions can best be probed and perpetuated. As a counterpoint to these arguments—which is itself acknowledged and discussed by Abrams (page 386)—it should also be noted that the presumed unity of Torah texts is itself an ancient axiom of rabbinic thought. This has been particularly emphasized in Chassidic thought, R. Menachem Mendel’s work being a case in point. See the relevant discussion and citations, below, n. 16. See the relevant article by R. Nochum Grunwald, in Ha-Rav: On the Tanya, Chabad thought, the path, leadership and disciples of Rabbi Schneur Zalman of Liadi (Mechon Ha-Rav, 2015), 573-586, where he aptly compares R. Menachem Mendel’s approach to R. Schneur Zalman’s oeuvre to that of the Tosafists to the Babylonian Talmud, and gives several illustrative examples. Grunwald’s treatment ought to provide a springboard for scholars to further analyze R. Menachem Mendel’s writings, including the examples he invokes, and to further unpack the full weight of their conceptual significance. See also the article by R. Nechemiah Teichman, Ibid., 587-606. In a similar vein to Grunwald see Ariel Roth, “Reshimu—The Dispute between Lubavitch and Kopust Hasidism,” Kabbalah 30 (2013), n. 122, who likens R. Menachem Mendel’s writing style to that of R. Akiva Eiger (1761-1837) in his notes to the Babylonian Talmud. Roth’s overall characterization is, however, more narrow than Grunwald’s and seems to be based on a relatively limited sample. The broad variety of writing styles employed by R. Menachem Mendel was further clarified for me by R. Eliyahu Matusof—lead editor of Otzar Ha-chassidim, Kehot Publication Society—who generously shared his expert knowledge of the relevant manuscripts, and clarified various aspects of R. Menachem Mendel’s writing and editorial work as they relate to the extent transcripts of R. Schneur Zalman’s teachings. I am grateful also to R. Moshe Gourarie—editor of the third volume of Chassidut Mevu’eret on Tanya, published recently by Heichal Menachem—for sharing both his own insight and his correspondence with Matusof regarding several relevant issues. See below, n. 41. With particular reference to Kabbalistic concepts, see Grunwald and Roth as cited in the previous note, and Eli Rubin, Covert Luminosity: The reshimu, the kav, and the concretization of creativity. More generally, see Naftali Loewenthal, “Reason” and “Beyond Reason” in Habad Hasidism, in Moshe Hallamish ed., ‘Alei Shefer: Studies in the Literature of Jewish Thought (Bar Ilan University Press, 1990), 123-126. Loewenthal specifically focuses on R. Menachem Mendel’s philosophical work, Sefer Ha-chakirah, noting that here “the third Lubavitch leader was applying the tools of Reason in examination of the tradition of Habad teachings of which he was the foremost inheritor and exponent…” He also concludes that R. Menachem Mendel “believes that a legitimate synthesis can be made of non-Jewish science, classical Jewish philosophy, the Talmud and Habad Hasidic teachings.” For an extended discussion of the explicit ways in which R. Menachem Mendel brings Kabbalistic texts into enriching and innovative interface with some of the classical Jewish thinkers mentioned above, see Dov Schwartz, Habad’s Thought: From Beginning to End (Bar Ilan University Press, 2010), 158-186, and 244-250. Schwartz focuses primarily on the treatise Mitzvat Ha’amanat Elokut in R. Menachem Mendel’s Derech Mitzvotechah. See also the relevant discussion in Elliot R. Wolfson, Open Secret: Postmessianic Messianism and the Mystical Revision of Menahem Mendel Schneerson (Columbia University Press, 2009), 336, n. 117. For a more theoretical discussion of this kind of synthesis in the thought of the seventh Chabad rebbe, Rabbi Menachem Mendel Schneerson (1902-1994, named for his great-great-grandfather and predecessor), see Eli Rubin, Intimacy in the Place of Otherness: How rationalism and mysticism collaboratively communicate the Midrashic core of cosmic purpose. R. Schneur Zalman of Liadi, Likkutei Torah, Vayikra, 51b–54d. For a discussion of other aspects of this discourse, and of the parable discussed here, as it is particularly applied to the kabbalistic motif of reshimu, see Eli Rubin, Absent Presence: The revelatory trace (reshimu) of divine withdrawal. For a general overview of some relevant sources see Rachel Elior, The Paradoxical Ascent to G‑d: The Kabbalistic Theosophy of Habad Hasidism (State University of New York Press, 1993), 79-91. Various aspects of this reinterpretation have been more specifically dealt with in successive articles by the present author. In addition to Covert Luminosity and Absent Presence, as cited above, notes 15 and 16, see the more foundational discussions in Eli Rubin, Immanent Transcendence: Chassidim, mitnagdim, and the debate about tzimtzum and Idem., Everywhere Revealed: How everyone, children included, can apprehend the unknowable essence of G‑d. This point is more coherently elaborated later on in the present discourse, Ibid., 53a, b and d, as well as in the second half of R. Menachem Mendel’s gloss, Ibid., 52d. See the more extensive discussion in Eli Rubin, Absent Presence: The revelatory trace (reshimu) of divine withdrawal. R. Menachem Mendel’s gloss appears between parentheses in Likutei Torah, Ibid., 52d-53a. Torah Or, 14a-b. For an extended discussion of this text, and of the way it is explained and refracted in the writings and teachings of R. Shalom DovBer Schneersohn, see Eli Rubin, Everywhere Revealed: How everyone, children included, can apprehend the unknowable essence of G‑d. See also Dov Schwartz, Habad’s Thought: From Beginning to End, 104, where this distinction between the light and the luminary is attributed to Chabad’s oral tradition, as transmitted to the author by Rabbi Zalman Gopin of Kfar Chabad. Schwartz is to be commended for reaching beyond the walls of the academy for theoretical insight. Yet he seems to have glossed over the strong textual basis for this distinction in many transcripts of R. Schneur Zalman’s teachings. Schwartz earlier (page 45) excerpts a passage elaborating on this distinction at some length, but his comments there inexplicably avoid the central thrust of its argument. Both R. Schneur Zalman’s words and R. Menachem Mendel’s comment, pointing out their significance, appear in Likutei Torah, Ibid., 52d. The excerpts in this passage are from R. Menachem Mendel’s gloss. My translation of the Hebrew clause “beteilim sham” as “effaced there” follows Elliot R. Wolfson, Open Secret, 90: “effacing is always also a facing of what cannot be faced.” For more on the context in which this formulation appears, a discussion of the negation of the world vis a vis G‑d, see below, n. 28. For further analysis of the significance of this formulation, see below, n. 34. This concept of divine unity has been variously described as divine monism, acosmicism, or panentheism, terms whose applicability in this context continues to be subject to debate. See Elliot R. Wolfson, Open Secret, 46-48 and 87-103. In the latter discussion he lucidly interprets panentheism as “the belief… that all being is in G‑d but G‑d is not identical with all being.” (Ibid., 88.) Wolfson continues to argue, however, that this insufficiently captures the Chabad conception, settling instead on the term “apophatic panentheism,” and explaining that “the One is affirmed in everything to the extent that everything is negated in relation to the One, but the One is negated in relation to everything to the extent that everything is affirmed in the One.” To speak of the negation of the One, he continues, is to probe “the void of the infinite,” the essence of G‑d’s “(non)being.” In this creative invocation of an “unutterable” and “apophatic dictum” Wolfson’s creatively forges a linguistic pathway depicting Chabad’s otherwise ineffable conception of divine singularity vis a vis the created world. In this context Wolfson describes tzimtzum as “the concealment within the actual nothing that bears the potential to become every other nothing in actuality.” (Ibid., 90-91.) But given the present discussion, we may suggest that “(non)concealment” would have been a more accurate formulation. Following the same line of argument, and marshaling a very persuasive array of textual supports along the way, Wolfson also rejects the term “acosmism” in favour of “acosmic naturalism”—“acosmic connotes that there is no world that is not enfolded in the essence… naturalism indicates that there is no unfolding [of the essence] without the enfolded [world]…” (Ibid., 93.) Indeed, Chabad sources consistently emphasize that it is specifically through the occlusion of the physical world that the essence, the ultimate (non)being, can be discerned. For more on the relationship between the first two sections of Tanya, see Eli Rubin, Can You Square the Circle of Faith? How to preserve an open mind and a unified core of cohesive meaning, and particularly n. 25. For an overview of the background to this conception of creation as divine speech, in the particular context of the teachings of R. DovBer, the Maggid of Mezritch, of whom R. Schneur Zalman was a close disciple, see Ariel Evan Mayse, Beyond the Letters: The Question of Language in the Teachings of Rabbi Dov Baer of Mezritch (PhD dissertation, Harvard University, 2015), 246-255. R. Schneur Zalman of Liadi, Tanya - Likutei Amarim (standard Vilna 1900 edition), 26b [52 in English pagination]. En passant, it is worth noting that in direct continuation of this passage R. Schneur Zalman expands this category of divine speech to include “the entirety of the Torah, Prophets, and Scriptures, that were apprehended by the prophets in the visions of their prophecy.” To apprehend the externalization of G‑d in creation, in other words, is to apprehend divine speech in a form that is analogous to the visionary experience of prophecy. In this vein see Ariel Evan Mayse, Beyond the Letters, 196-198, for a discussion of a parallel teaching, attributed by R. Solomon of Lutsk to R. DovBer, the Maggid of Mezritch, of whom R. Solomon and R. Schneur Zalman were disciples, which also focuses on the “letters” of divine communication. While this teaching doesn’t go so far as to equate the experience of created reality with the experience of prophecy, it does develop the notion that “everything is the illumination, divinity and vitality of the blessed Creator” at much greater length. Ibid., 27a . “Concealed countenance” is a paradoxical locution which points to the revelation of the divine countenance—rather than the mere presence of the concealed essence—within the occlusion of tzimtzum and creation. The Hebrew term, “hester panim,” might also be rendered “effaced face.” Following Wolfson—as cited above, n. 27, and below, n. 34—this entails the facing of the face that cannot be faced, which suggests that the concealed face is the face of the ineffable. To conceal G‑d’s countenance, in other words, is to disclose G‑d’s essence. This is a point that runs contrary to the superficial reading of the text as described here, but which will be borne out below, as we follow the clues of R. Menachem Mendel’s gloss in Lehavin Mah Shekatuv Be’otzrot Chaim. Tanya, Ibid., 42a , excerpted by R. Menachem Mendel in Likkutei Torah, Vayikra, 52d. Exodus,33:23. See Elliot R. Wolfson, Open Secret, 90, as discussed above, n. 27. See above, n. 25 and 26. 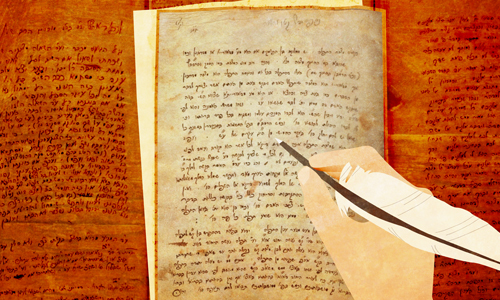 While the analogy in Likutei Torah describes the study of an already existing text, a related teaching of R. DovBer, the Maggid of Mezritch, aptly invokes the act of writing—the formation of letters—as a model for the external expression of inner-vitality. See the excerpts cited and discussed in Ariel Evan Mayse, Beyond the Letters, 210-211. Further afield we find a more explicit description of text as the self-externalization of divine being. Daniel Abrams, Kabbalistic Manuscripts and Textual Theory, 554-556, highlights a passage in Midrash Konen that describes the text of the torah as being “bound on the arm of the Holy One.” A move that, in Abrams’ formulation, “collapses the distance between G‑d as author and reader and the text written out in an external and physical site that is gazed upon as the other.” This midrash, however, is explicitly referring to the status of the Torah as it precedes creation. R. Menachem Mendel’s discussion in Likutei Torah extends a similar model to encompass not only the transcendent Torah, but the entirety of the cosmos, including the physical world. For a relevant discussion charting the necessary application of new theoretical and methodological paradigms to the study of Chassidism, see Daniel Abrams, Ibid., 579-586, 625-630. Particular reference being made to the need to “highlight the later glosses interpolated into the text,” the present study represents a narrow test case demonstrating how fruitful such endeavors can be. This also reflects a wider and increasing trend among traditional Chabad scholars to pay more attention not only to explicit glosses but also to those that can only be discovered through more rigorous analysis, including the consultation of variant texts and extant manuscripts. My correspondence with several scholars, both in Chabad and the academy, confirms that many interpolations by R. Menachem Mendel remain unmarked in their published versions. For more on Abrams’ theoretical paradigm and its relevance to the present study, see above, n. 14. For an example of a recent publication that seeks to isolate all of R. Menachem Mendel’s interpolations in a single discourse, see R. Levi Gelb, R. Moshe Gourarie, et al (eds. ), Likutei Torah Ha-mevu’or, Vol. 4, Issue 155, [Dibbur Hamatchil Mah Tovu] (Machon Le-avdecha Be-emet, 2015). See also below, n. 41 and n. 45. There are two notable exceptions to this generalization. Firstly, the somewhat lengthier treatise on the commandment to believe in G‑d; Derech Mitzvotechah, 42b-59b. Secondly, the even longer treatise on prayer; Derech Mitzvotechah, 115a-147b. The latter treatise should be viewed as a separate work, as is the case with various other discourses appended by the publisher. The central Chabad Library holds two separate manuscripts in R. Menachem Mendel’s hand; No. 82, comprising the treatise on prayer, and No. 79, comprising Derech Mitzvotechah, along with notes to the Tanya, which also appear in the published editions. See R. DovBer Levine, Exhibition of the Tzemach Tzedek, the Third Chabad Rebbe, at the Chabad-Lubavitch Library, 7. For a general overview of the scope and content of Derech Mitzvotechah, see R. Dovid Olidort, Sefer Derech Mitzvotechah Le-admur Ha‘Tzemach Tzedek’. For some noteworthy remarks on the distinct style of R. Menachem Mendel’s writing in Derech Mitzvotechah, see R. Mordechai Menasheh Laufer (ed. ), Ha-melekh Be-mesibo Vol. 2 (Kehot Publication Society, 1993), 85-86. The present description of R. Menachem Mendel’s approach is based on my comparative reading of several different versions of discourses that appear in Derekh Mitzovetkah, and on my consultations with R. Moshe Gourarie, R. Eliyahu Matusof, and R. Yosef Keller. In a private communication Matusof wrote: “In Likutei Torah R. Menachem Mendel apparently assumed that it would be easy [for the reader] to distinguish between what is from R. Schneur Zalman, and between the citations and kabbalistic interpolations that are his own… [even] by only reading the words, and without studying the manuscripts. Whereas in the case of Derech Mitzvotechah it was at the outset written in a different form and order than as it was said by R. Schneur Zalman.” Matusof also argued that this goes some way to explain why the former work is generally attributed to R. Schneur Zalman, and the latter to R. Menachem Mendel. See the relevant comments and citations, above, n. 15 and n. 16. See Lehavin Inyan Lag Be-omer, in Maamarai Admur Ha-zaqen - Parshiyot, Vol. 2 (Kehot Publication Society, 1983), 591-593. In a private communication R. Yosef Keller wrote: “According to my research this discourse was delivered by R. Menachem Mendel on Lag Be-omer, 5588 . A synopsis of this discourse exists in the handwriting of R. Menachem Mendel, in Manuscript Vol. 1114, folio 74a, and is published in Or Ha-torah - Vayikra, Vol. 4, 1117.” For another version of this discourse, see Tamim Tihye, in Or Ha-torah - Devarim, Vol. 2 (Kehot Publication Society, 1965), 838-841, which according to Keller was delivered by R. Schneur Zalman in the month of Elul, 5558 . See see R. Yosef Yitzchak Keller, Reshimat Maamarei Admur Ha-zaken, 362, n. 43. In a private communication Keller added that the published version is a transcript by R. DovBer, the son of R. Schneur Zalman, “with additional notes.” Accordingly, the version delivered by R. Menachem Mendel (that is Lehavin Inyan Lag Be-omer) appears in a collection of R. Schneur Zalman’s discourses, while that delivered by the latter appears in a volume of the former’s discourses. This bears out Abrams’ rightful rejection of the erroneous claim “that there is little need for manuscript in the study of Hasidism, since print had already been invented.” (Abrams, Kabbalistic Manuscripts and Textual Theory, 629.” Keller further wrote: “There are many discourses printed in Or Ha-torah that are R. DovBer’s transcripts [of R. Schneur Zalman’s discourses], or which were printed in Maamarai Admur Ha-zaqen that are discourses of R. Menachem Mendel based on discourses of R. Schneur Zalman.” This is further complicated by the fact that Or Ha-torah - Bereishit, Vol. 6 (Kehot Publication Society, 1972) incorporates material from Likutei Torah Al Gimmul Parshiyot (Vilna, 1884), which includes glosses by R. Shmuel, the youngest son of R. Menachem Mendel. R. Shmuel’s glosses are marked by round parentheses, and R. Menachem Mendel’s by square parentheses, but this distinction is not properly noted by the editors of Or Ha-torah. Returning to the various versions of the particular discourse under discussion, I want to thank Shaul Magid for bringing to my attention a teaching by Rabbi Levi Yitzchak of Berditchev, which contains the nucleus of the idea that is explained more elaborately in the Chabad discourses cited and discussed in the present article. R. Levi Yitzchak’s teaching also contains an important addition that will be discussed more directly below. This suggests that the teaching may have originated in the court of R. DovBer, the Maggid of Mezritch, who counted both R. Schneur Zalman and R. Levi Yitzchak as disciples. See R. Levi Yitzchak of Berditchev, Kedushat Levi Ha-shalem Vol. 2 (Jerusalem, 1958), 413-414. See also the extensive analysis of this teaching in Shaul Magid, Jewish Ethics Through A Hasidic Lens, in Hasidism Incarnate (Stanford University Press, 2015), 62-66. Derech Mitzvosechah (Kehot Publication Society, 1991), 28a-29b. See the relevant citations and discussion, below, n. 58. Wexler begins with the roots of Scholem’s thesis in the work of Ernst Troeltsch, who described mysticism as “radical individualism” that “has no social influence on life in general” other than to weaken collective religious institutions. Scholem follows Troeltsch in describing a mystic’s life as “a life of inwardness” that “creates a distance between him and society,” but allows that having achieved a “new quality of being” the mystic can later return to society and have an impact on social life. Wexler characterizes this as an unwitting “de-socialization” of mysticism, relegating the social to the secondary status of a context in which the wholly individualistic experience of the mystic takes place. In Scholem’s analysis the dialectical divide between the social and the spiritual is upheld rather than dissolved. The present study heeds Wexler’s call by reading R. Menachem Mendel’s discourse on the commandment to “love your fellow” as an explanatory social theory that in fact turns the Durkheimian paradigm on its head. Rather than seeing the social as the source of mystical experience—and in stark contrast to Durkheim's reductionist statement that G‑d and society are “one and the same”—here it is the spiritual, and more precisely, the sacred, that is the source of social integrity. Durkheim’s view might be described as a kind of pantheistic sociology. But in R. Menachem Mendel’s discourse we glimpse the apophatic socialization of spirituality and the divine. G‑d is affirmed in society to the degree that society is transparent to, and thus effaced within, the divine source of social integrity. The sacredness of personal spirituality is only affirmed to the degree that it effaces the cosmic boundary that separates the other from the experience of the individual. These ideas, and the way they are developed by R. Menachem Mendel, will be more fully explicated below. Their present formulation, however, reflects a reapplication of Elliot Wolfson’s notion of “apophatic panentheism”—as discussed above, n. 28—offering new insight into the socialization of the sacred and the sacralization of the social. This is not to dismiss Durkheim’s paradigm completely, but to go beyond its reductionist stance. Though from this new perspective the social is seen to be rooted in the sacred, rather than the other way round, there is no denying that the social is often the seminal medium in which man encounters G‑d. In the Chassidic context, Wexler points to the specific example of the farbrengen, describing it as a “collective assembly” whose “ecstatic properties may be more than a reaffirmation of collective representations and an intensification of feelings of attachment among the participants.” (Emphasis added.) According to Wexler the farbrengen offers “a practical embodiment of the theory of ahava, love of collectivity,” a theory that will be explored more fully below. What is notable here is Wexler’s emphasis that the farbrengen does not embody a zero sum paradigm, in which self and society cancel one another out, but that “this is a form of self-dissolution which is also a self-enhancement—not of power but of self-love.” (Mystical Sociology, 68.) Following Wolfson’s model, this can be thought of as an apophatic process, in which self-love is enhanced and refined through the dissolution of self in society and G‑d. Derech Mitzvosechah, 28a. R. Chaim Vital, Ta’amai Ha-mitzvot, in Likutei Torah Nevi’im U’ketuvim (Vilna, 1880), Kedoshim, 77a . Here, and in the previous paragraph, an overtly incarnational trope is introduced, a point emphasized by Shaul Magid,as cited above, n. 45. See Guide for the Perplexed, 1:72 and 2:40. In the first of these sources, intersocial dependency is used to explain why man is described as a microcosm. Such intersociality, and the intellectual prowess it requires, is further described as “the most noble quality of life, which is also very much concealed. Its truth is not understood… as are other natural qualities.” Perhaps herein lies a hint to something more than the utilitarian, but whatever that may be it is not explicated. Ibid.. For a more explicit iteration of this conceptualization of mah, see Rabbi Shalom DovBer Schneersohn, Sefer Ha-maamarim 5661 (Kehot Publication Society, 1985), 164. Related concepts associated with mah are ecstacy (ratzo) and effacement (bitul) before G‑d, see for example R. Menachem Mendel Schneersohn, Biurei Ha-zohar - Tzemach Tzedek Vol. 2 (Kehot Publication Society, 1978), 1048-1051. For more on tohu and tikun, see “Part Two—A Sample” in Eli Rubin, Living with the Times: Rabbi Schneur Zalman of Liadi’s Oral Teachings. Rabbi Chaim Vital, Pri Etz Chaim, Shaar Olam Ha-asiyah, 81; Rabbi Abraham Abele Gombiner, Magen Avraham to Shulchan Aruch Orach Chaim, at the beginning of section (siman) 46. See for example the classical commentary of Maharsha (Rabbi Shmuel Eidels, 1555-1631), to the Talmud, Shabbat 31a, who writes explicitly that Hillel was of the opinion that the verse “love your fellow as yourself” refers only to negative commandments such as those referred to in the first half of the passage (Leviticus 19:18): “You shall neither take revenge from nor bear a grudge.” This is particularly noteworthy as R. Menachem Mendel closely replicates Maharsha’s formulation of the question that precedes the conclusion cited here. It is also noteworthy that Nachmanides, in his commentary to Leviticus 19:18, writes “the heart of man cannot accommodate the love of one’s fellow as one loves oneself.” In light of the present discussion, it may be suggested that this is the case so long as one’s fellow is seen as “other” than oneself, but in seeing the other as an integral part of your own self you can indeed love them as yourself. For contemporary discussions of empathy, see below, n. 60. On the contemporary study of the emotions in relation to Kabbalah more generally, see the relevant comments and citations in Jonathan Garb, Shame as an Existential Emotion in Modern Kabbalah, in Jewish Social Studies 21 (1) (Indiana University Press, 2015), 89–122. This article is particularly notable in the present context as on the emotional spectrum empathy and shame might be aligned in direct opposition to one another, the former being the antidote to the latter. There is considerable scientific material on empathy. See for example, Mark H. Davis, Empathy: A Social Psychological Approach (Westview Press, 1996) ; Sheila Haugh and Tony Merry (Eds. ), Rogers' Therapeutic Conditions: Evolution, Theory and Practice. Volume 2. Empathy (PCCS Books, 2001); Jean Decety and William Ickes (eds. ), The Social Neuroscience of Empathy (MIT Press, 2011). The first chapter of the latter work lists no less than eight distinct but related phenomena that are all described by this one word. Davis gets around this problem by creating an organizational model of empathy including cognitive and affective elements, and broken into four general components, antecedents, processes, intrapersonal outcomes, and interpersonal outcomes. But this approach too is fundamentally episodic, whereas the model of empathy described in the present discourse is a way of being in society, a cognitive and affective discipline rooted in a particular view of the cosmos. The point here is not to try and replicate the experience of the other, but to overcome the impulse to see people as other than oneself, instead replicating the elemental love you extend to your own self in your interpersonal relationships. Despite this distinction, here too the model developed by Davis might be useful, the primary antecedent being the view that we are all limbs of a single collective soul, the process being the replication of loving self-knowledge in your attitude to the (non)other, and the primary outcome being the suspension of vindicative judgement. On the need to use your intellect to prevent your shortcomings and sins from arising in your thoughts and causing anxiety, low spirits, and depression—and for various practical contemplative strategies—see R. Schneur Zalman’s extensive discussion in Tanya from Chapter 26 and on. On the adoption of a similar attitude towards others, and on the requirement to suspend vindictive judgement, see Tanya, Chapters 30 and 32. See also the formulation by Rabbi Avraham Yitzchak Kook, cited in Jonathan Garb, Yearnings of the Soul, 95: “Whoever has within him the pure odor of the fragrance of the paradise of the Messiah sees no debit in anyone in Israel, and his love for each one of Israel is infinitely great…"
In Wexler’s discussion of the earlier section of this discourse (Mystical Sociology, 69) he invites comparison of R. Menachem Mendel’s teaching on love to the definition offered by Theodore D. Kemper: “Love is a relationship in which at least one person gives (or is prepared to give) extreme amount of status to another.” (Status, Power and Ritual Interaction (Ashgate Publishing, 2011), 261.) Given the present analysis we may offer the following definition: Love is a relationship in which the binary between self and other has been overcome by empathy. Derech Mitzvosechah, 28b. On the unification of qudsha brikh hu and shekhinteh as the main component of every commandment, through which the Messianic era will arrive, see R. Eliyah de Vidas, Reishit Chochmah, Shaar Ha-ahavah, Chapter 8 and 9. See also R. Schneur Zalman of Liadi, Likutei Torah - Ve-etchanan, 9a-9b; Ibid., - Derushim le-Rosh ha-Shana, 55c; and R. Shalom DovBer Schneersohn, Yom Tov Shel Rosh ha-Shanah 5666 (Kehot Publication Society, 1991), 6. See Nachmanides’ commentary to Genesis 2:23 and elsewhere, along with the relevant discussion in Elliot R. Wolfson, By Way of Truth: Aspects of Naḥmanides’ Kabbalistic Hermeneutic, in AJS Review 14:2 (Autumn 1989), 115–116, and sources cited there. See also Rabbi Chaim Vital, Shaar ha-Kavanot, Derushei Rosh Hashanah, 3, and Rabbi Schneur Zalman of Laidi, Maamarei Admor ha-Zaken 5566, vol. 2 (Kehot Publication Society, 2005), 449. For further discussion see the section “Dialectic Union” in Eli Rubin, The Second Refinement and the Role of the Tzaddik. Derech Mitzvosechah, 28b. The locution “cosmic society” is derived from Philip Wexler, Mystical Sociology, as cited above, n. 49. In the later chapters of that work, Wexler coins the term “cosmic interactionism,” in order to bring religiosity and the divine to the fore of what is otherwise covered by the more generic rubric of “symbolic interactionism.” In so doing he charts a vision for a new mystical sociology in which the symbols that bind societies together, and which determine the place of the individual within society, are no longer limited to the mundane. Here, R. Menachem Mendel provides just such a model, in which G‑d doesn’t just provide the basis for an integrated society, but is in fact the all-encompassing medium of cosmic interaction. A paraphrase of Tzefanyah 3:9. A paraphrase of Isaiah 2:3. Rabbi Levi Yitzchak of Berditchev, Kedushat Levi Ha-Shalom, Vol. 2 (Jerusalem, 1958), 413-414. As a further counterpoint, we should note the positions taken by seventh rebbe of Chabad, R. Menachem Mendel Schneerson (1902-1994) : History is seen as the canvas upon which the fullness of Torah’s essence unfolds. Accordingly, to jettison a part of that historic unfolding would be to jettison a part of the Torah itself. Similarly, while making a strong case for the Torah’s universal message, R. Menachem Mendel also emphasised Maimonides insistence that its universal precepts be accepted expressly “because G‑d commanded them in the Torah and made them known to us through Moses our teacher.” (Mishneh Torah, Laws of Kings and Their Wars 8:10–10:11.) A universal ethic, in other words, must ultimately stand on the firm ground of revelation. On both of these topics, see the citations and extensive discussion in Eli Rubin, Divine Zeitgeist—The Rebbe’s Appreciative Critique of Modernity.